Just got off the phone with Larry from FAE. Due to the fact that I have a current order in for an FAE, I was afforded the option to go with a mandrel bent version of the FAE that will be available in upcoming months (or sooner). The new exhaust will be polished and look very similar to the Malibu Surf Pipe. It will also have the spray deflector welded on which also looks very similar to the Malibu exhaust. 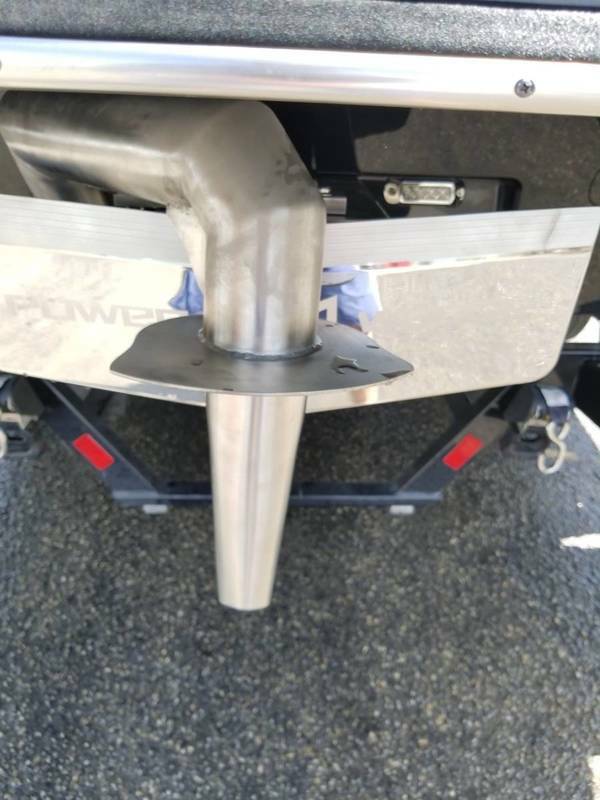 The one difference Larry mentioned was that the FAE will continue to have the wedge frame attachment point unlike the Malibu version that just attaches at the transom. Since the new version is a "thru hull" install, FAE will also be offering a baffle delete kit that will optimize the efficiency of the motor. Finally the cost of the FAE will be considerably less expensive than the Surf Pipe. I hope this all isn't "known" news already.... its exciting to me though so I thought I would share. Great news! I was planning on installing one in the off season. I was gonna go with the Malibu pipe, but Ill have to wait to see what this new FAE looks like. According to Larry its going to look A LOT like the Surf Pipe with an extra mounting point. Apparently Larry and FAE designed the Surf Pipe and at the beginning was the one manufacturing for Malibu..... but when the numbers requirement stepped up they were unable to keep up so Malibu went somewhere else for manufacturing. Now that FAE has the manufacturing capability they are stepping up with the Mandrel bent version on a large scale. as for FAE beating Malibu's price.... I will just say that wont be hard to do for any accessory with a Malibu label on it. According to Larry the savings will be significant. Right on! I’m looking forward to seeing what he comes up with. Since FAE is located in Texas, where would you go to get your FAE installed (Malibu dealer)? Has anyone accidentally burned their skin on the FAE / Surf Pipe while swimming or loading onto swimdeck (exhaust pipe seems very close to edge of swimdeck)? How many hours does a normal install require? Id be more worried about cutting your feet on it. Doubt that something surrounded by a lake ful of water stays hot enough to burn you. I just received a surfpipe in March and it is neither the mandrel bend nor has the spray guard. Wow, things change quickly. I put mine on and after about five times being out, I realized it burned more fuel and I was losing too much power. I have since removed it and reached out to FAE for suggestions, but I haven't heard back from them. Hell, ive kicked the power wedge on my boat, that pipe is a lot further forward. It will also have the spray deflector welded on which also looks very similar to the Malibu exhaust. I've been waiting for months for mine...I'm hoping I get it before the end of the season. My boat had a huge spray problem that ruined the surf wave, resulting in my need to install a surf flap. If this can erase that needs, I'm very excited for it. #1: Since FAE is located in Texas, where would you go to get your FAE installed (Malibu dealer)? #2: Has anyone accidentally burned their skin on the FAE / Surf Pipe while swimming or loading onto swimdeck (exhaust pipe seems very close to edge of swimdeck)? #3: How many hours does a normal install require? #2: Not possible. Go run your boat hard, open the engine compartment then touch the exhaust manifold. It will be warm - perhaps even relatively hot. That is by far the hottest part of the exhaust. Water runs through the exhaust. By the time it gets outside the boat, it not only has water on the inside of the pipe but also the outside. #3: Couple hours taking your time and doing it right. If you need to replace the exhaust going through the hull (I went from STE's back to flappers for the mount) it will take longer due to the removal/install and PITA cleanup of sealant. None of that is required if you have existing flappers. Thanks for all the answers. Love the above line. You really can't -- unless water stops running though your exhaust which means your motor will overheat anyway if you run it. I researched pretty deep when I made my own surf pipe that comes out right below the swim deck. You should not lose power. Keep calling FAE, Larry is a standup guy who should work with you. Might be something else going on. I got tired of waiting for Malibu and FAE to make my dream surf pipe, so I drew up my own design with input from guys on wake garage and eventually built this earlier this year. I don't encourage DIY pipes if you are just trying to save money (FAE and Surf Pipe are not over priced for what you get).... but in my case it solved all of my concerns. And inside muffler delete via 2 mandrels and a homemade merge collector. Less pipe, no hard 90s, no power loss. I put mine on and after about five times being out, I realized it burned more fuel and I was losing too much power. You need to do the muffler delete. That should resolve your issue (and as an extra bonus, you get extra room in the engine compartment).